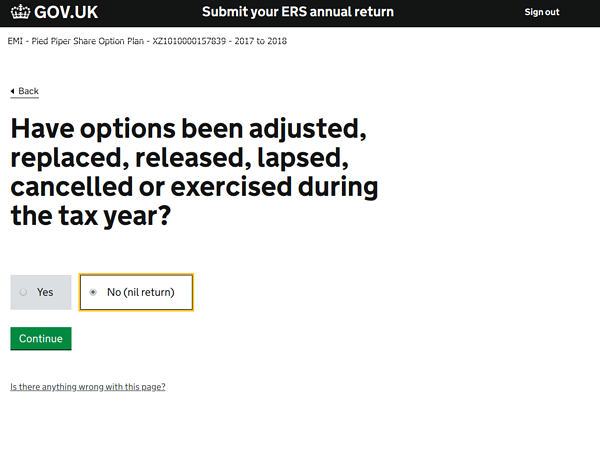 As a Capdesk subscriber, your annual report is automatically filled and updated every time an action takes place, so you simply have to export it and then upload it to the HMRC website. If not, you’ll need to manually create a spreadsheet with this information instead. 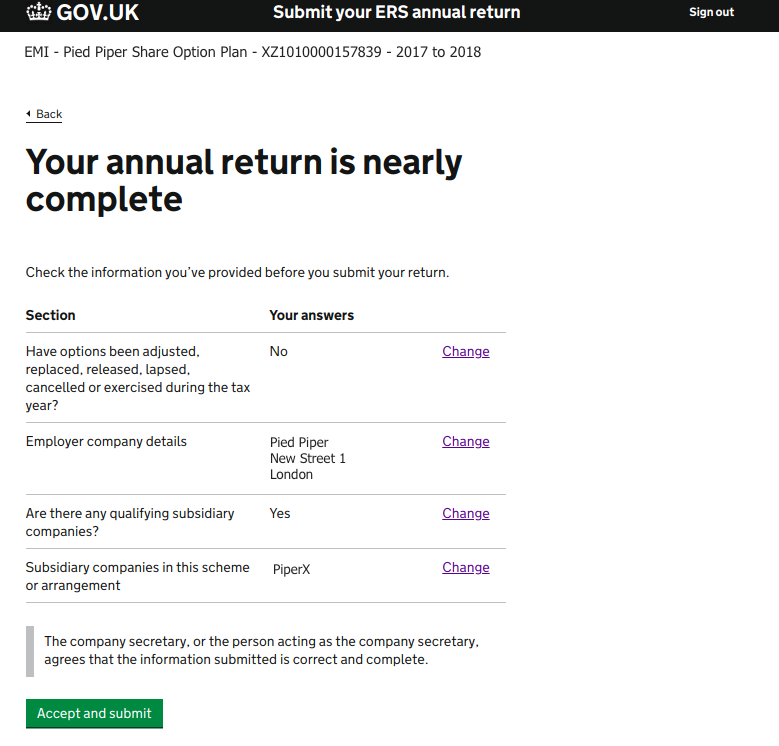 First, head to the HMRC login page and sign in to your company’s PAYE account. If you do not already have one you’ll need to register. 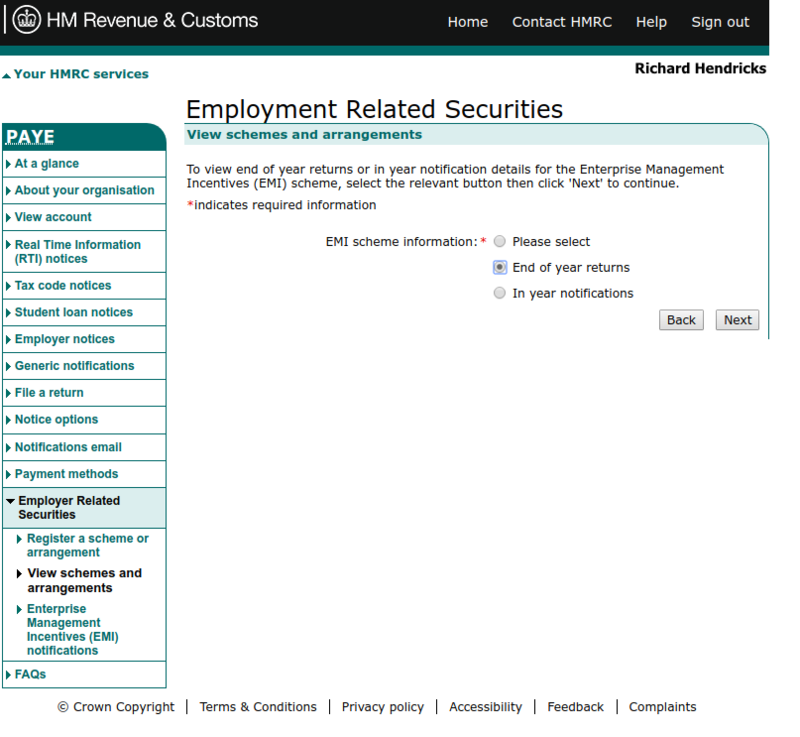 On the left-hand side menu, select ‘Employer Related Securities’ and then ‘View schemes and arrangements’. This will prompt you to pick which kind of EMI information you wish to submit. 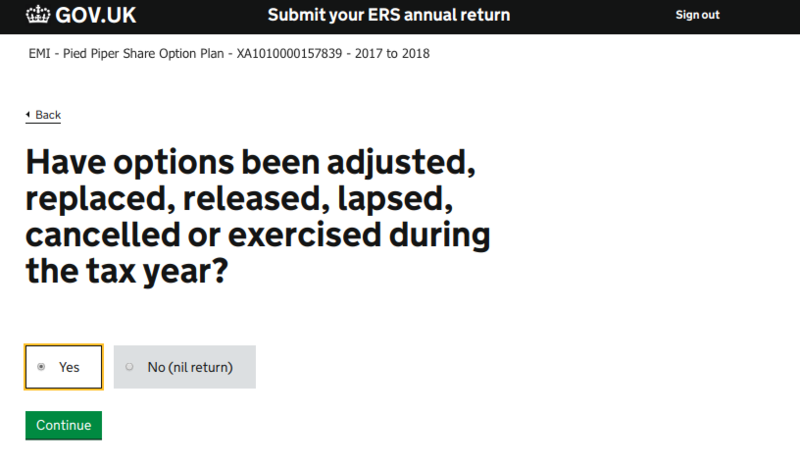 Select ‘End of year returns’ and click ‘Next’. On the following page, you will be shown a table with recent tax years. 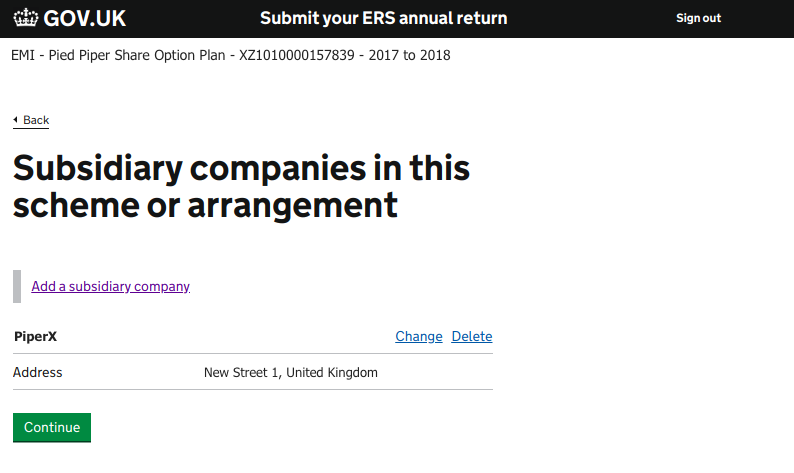 The hyperlink ‘Submit Annual Return’ will appear next to the tax year that you are able and obliged to file a report for. Click that link to start your submission. 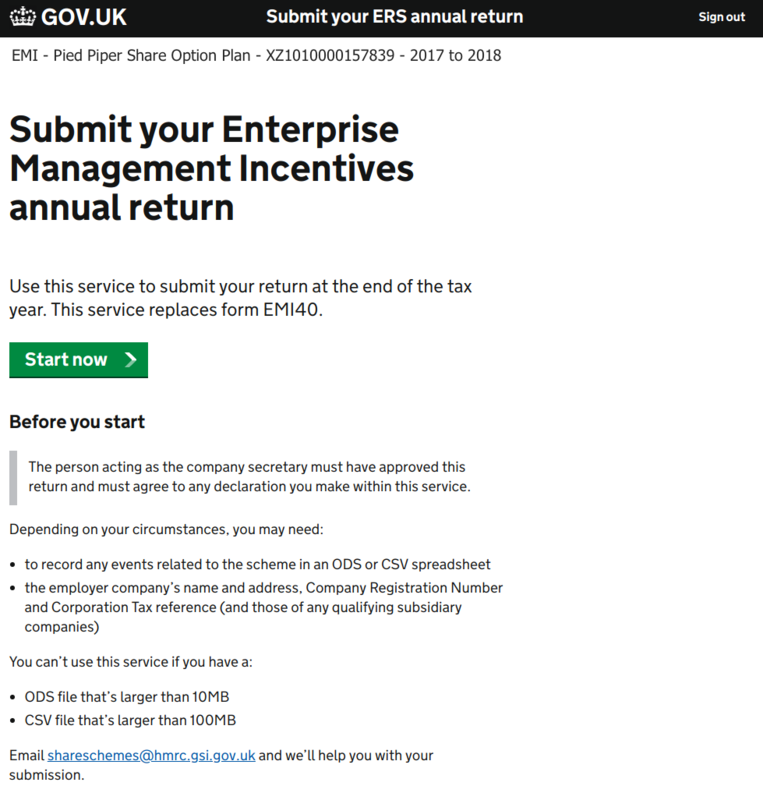 This will direct you to a page (shown below) with some additional information about the process of filing your EMI Annual Return. Read it and then click ‘Start Now’. 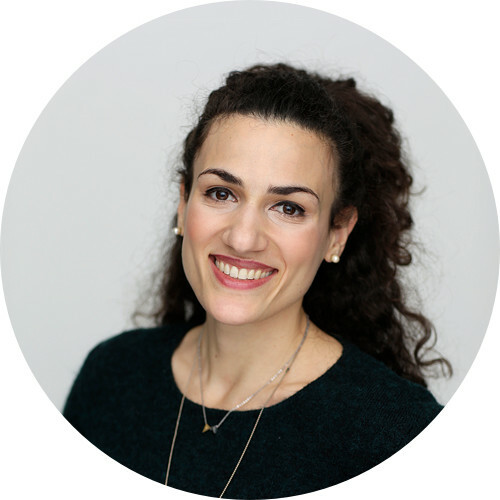 The first part of your application asks whether any actions have taken place relating to your EMI options. If no activity needs to be reported regarding your grants, select ‘No (nil return)’ and click ‘Continue’. 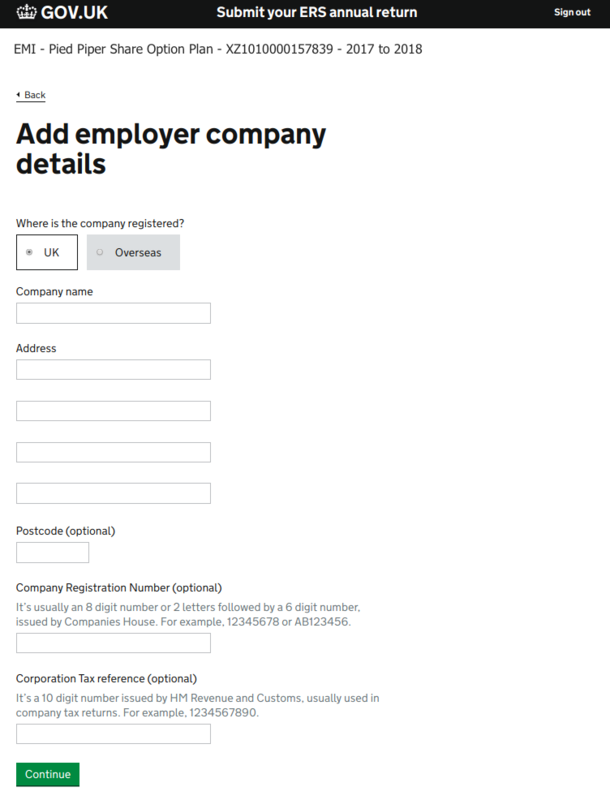 This will automatically take you to step 3, adding your employer company’s details, discussed further down. If there is activity to report, select ‘Yes’. Now, you’ll have to upload your annual report, detailing the specific actions you are reporting. You have the option to upload either a .csv or an .ods file. If you are uploading a spreadsheet you made yourself, select the file type you used. If you are using Capdesk’s automatic export file, pick .ods. A ‘Choose File’ button will appear on your screen. 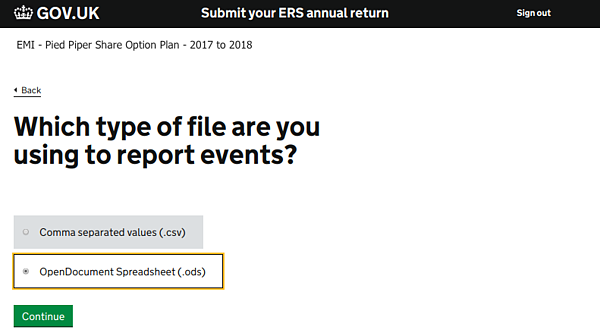 Click it to browse through your personal files and select your annual report. Then hit ‘upload’. 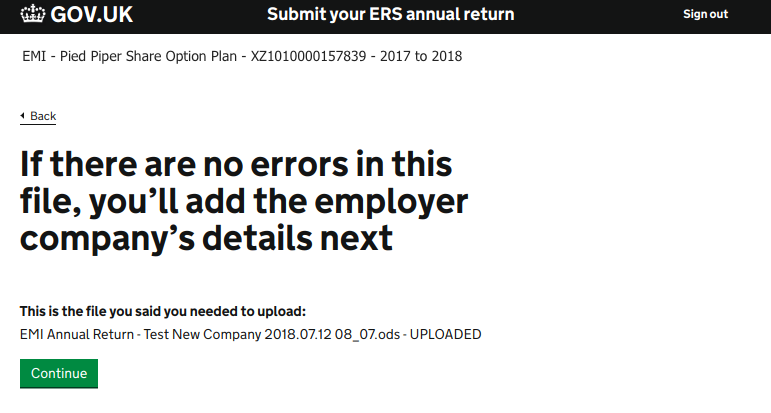 Next, HMRC will give you a chance to review that you indeed uploaded the correct file. If so, click ‘continue’ to proceed to the next section. 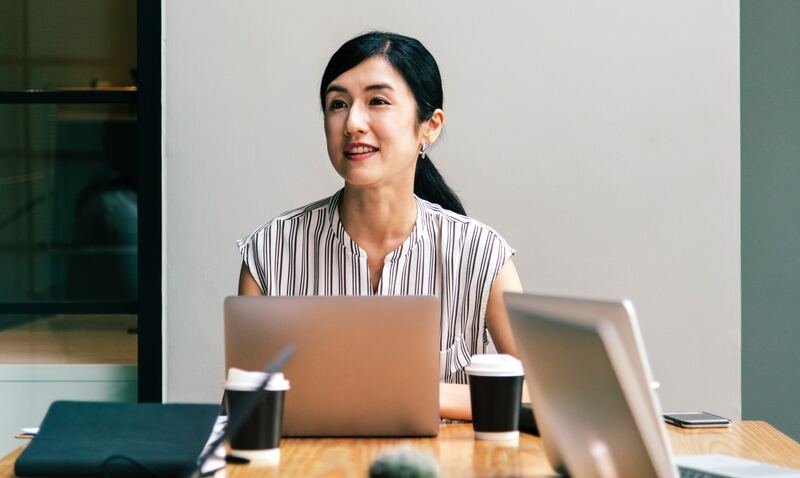 In this section, you will be asked to choose whether your company is based in the UK or overseas. 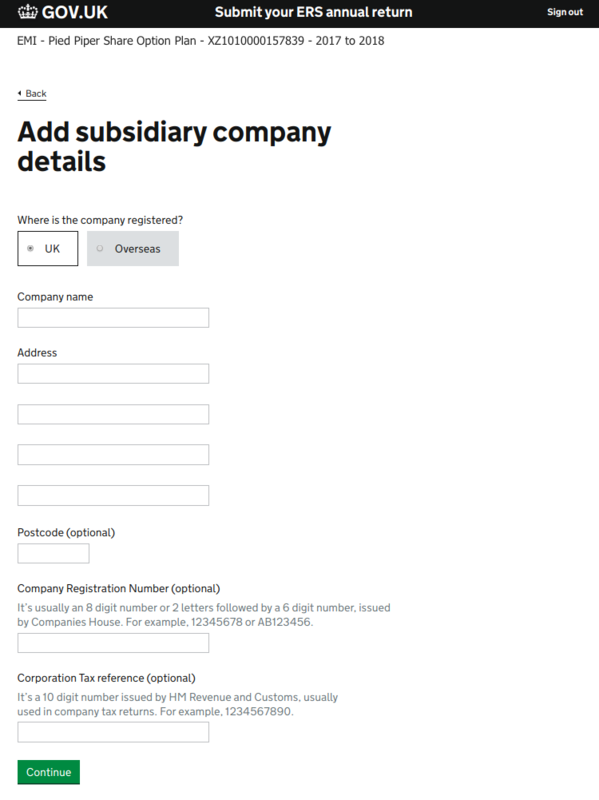 Then, enter the company’s name and address, and possibly its registration number and corporate tax reference. Click ‘Continue’. Now, you’ll need to declare whether there are any subsidiaries to your company. Then click ‘Continue’. 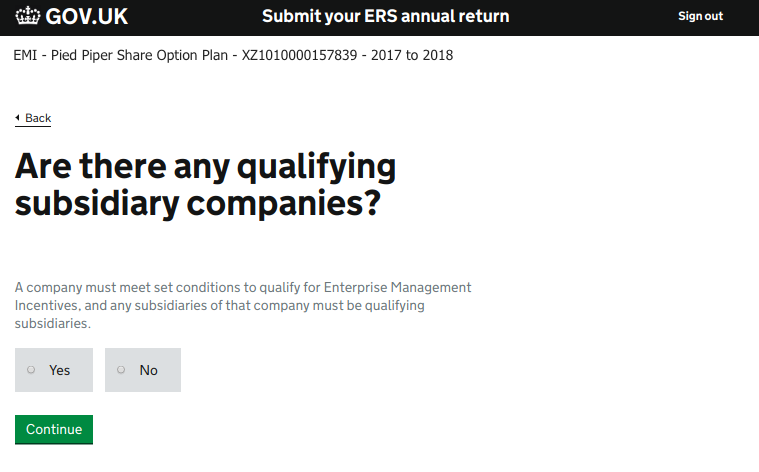 If you selected ‘Yes’, you’ll now need to provide the subsidiary’s information too. Once you click ‘Continue’, you’ll be shown a review of the subsidiaries you’ve included so far. Here you can make changes to the subsidiaries you added, or add a new one. Click ‘Continue’ when you are done. Finally, you’ll be able to review your application and make any changes necessary before hitting ‘Accept and Submit’ to finalise your submission. Congratulations! You are officially done and won’t have to deal with your Annual Return for another year! 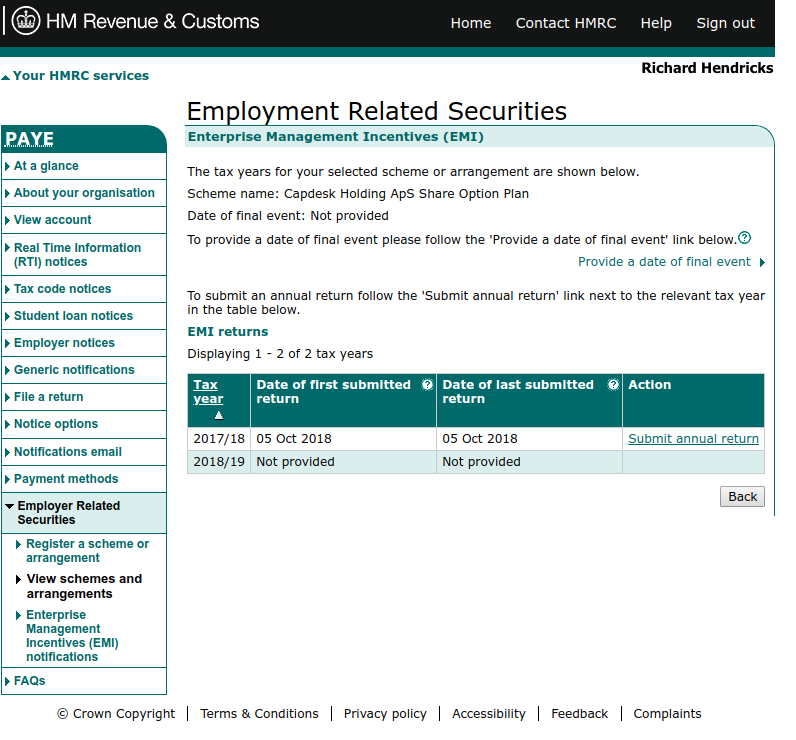 You should also be seeing a submission confirmation from HMRC on your screen now.